The T&T Company produces three chemicals – chemical P, chemical Q and chemical R. Chemical P is sold for $7 per liter, chemical Q for $5 per liter and chemical R for $8 per liter. During the month of July, 20,000 liters of chemical P, 50,000 liters of chemical Q and 30,000 liters of chemical R were produced and sold. There were no inventories at the start and end of the month. The company uses market value method for allocating joint cost to joint products. 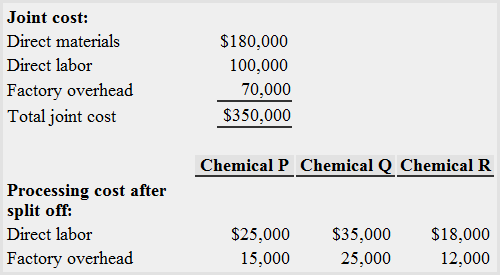 Allocate joint cost and compute gross profit for each chemical. Decide whether chemical P should be sold at split-off point for $4.50 per liter or processed further and sold for $7 per liter. The joint cost is 70% of the hypothetical market value. Hypothetical market value is equal to the ultimate market value less processing cost after split-off point. Required: Which product(s) should be sold at split-off point and which product(s) should be further processed after split-off point. All processing costs are variable. According to above analysis, product A should be sold immediately after split-off point but products B and C should be processed further. If product A is processed further, it gives a negative additional contribution margin which means the further processing of this product would negatively impact the net profit of the firm. In case the products B and C are further processed, their differential revenue becomes more than their differential cost which means an additional contribution margin for these two products. The higher contribution margin would eventually translate into additional profit for the firm.